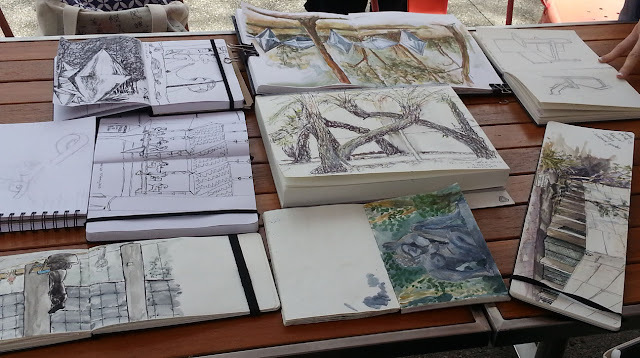 Hello everyone, I'm Leonie from Urban Sketchers Canberra, one of the newest groups in the Urban Sketchers family. 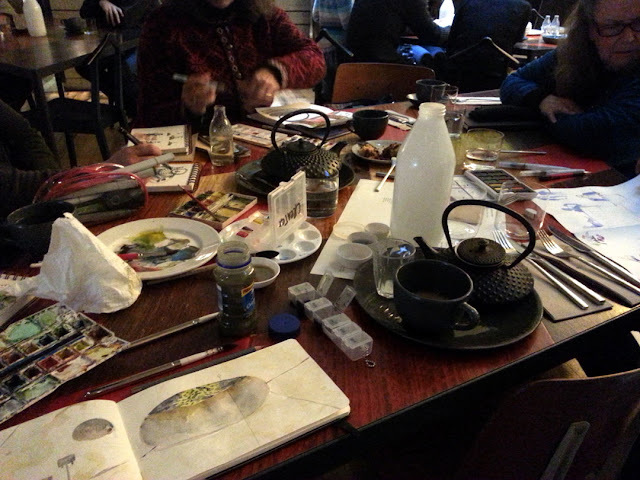 Our group started in February this year when several of us 'met' on-line and decided to get together for some sketching. We found some more like-minded people and before we knew it we had our first outing at the National Gallery of Australia. 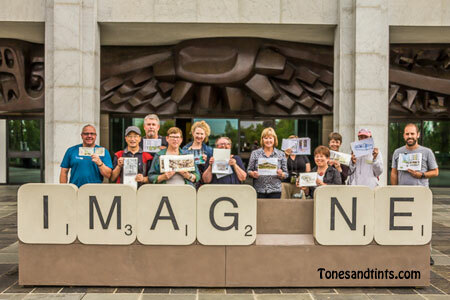 In May we met up with our first USk visitor, from Melbourne, at the National Museum of Australia. Not only did we get some hot tips about the use of pill boxes as watercolour palettes, but she also dazzled us with the sheer number of sketches she managed to produce in our short time together. In June we discovered that drawing outside when it is only 4 degrees C is not a good idea, although several new people bravely joined us that day. July saw us sitting around more comfortably in Hotel Hotel, one of the hippest new developments in Canberra, and a much better option for winter sketching! 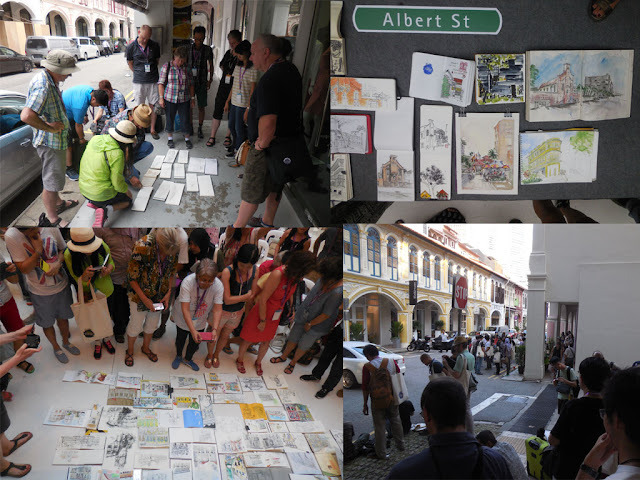 The highlight of the year for me was the chance to meet up with other USk members at the 2015 USk Singapore Symposium. Several of our group went to Singapore and this experience, more than any other, confirmed our desire to formally join USk so that all our members could share the experience of meeting like-minded people from around the world. Through this year we've developed a core of regular sketchers and every sketch outing new people are joining us. There is certainly no shortage of interesting places for us to draw in this city of ours. Apart from national monuments and institutions, we've met in hipster hot spots as well as historic precincts, drawing everything from food vans to Ferris wheels. Urban Sketchers Canberra welcome USk members from all over Australia and around the world, to join us in exploring our city. Please get in touch if you are planning a visit, we'd love to catch up with you or provide some suggestions for places to sketch (or even where to eat well!). 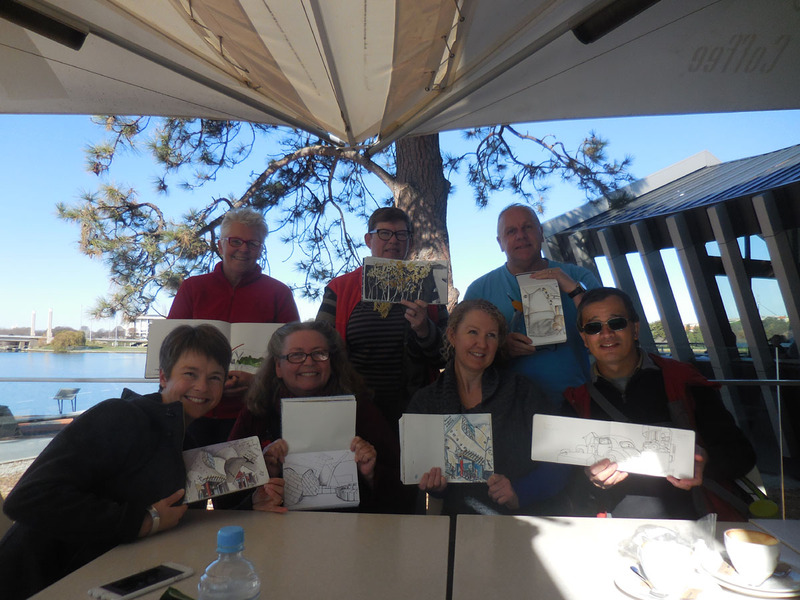 USk Canberra meets on the first Sunday of every month, from 10.30 am to 12.30 pm for sketching, followed by coffee and a chat. You can email us, or see what we are doing on our Facebook page. The Jacarandas are blooming in Brisbane City.